Leicester Riders were crowned BBL playoff champions after victory over Newcastle in today's final. Leicester Riders still in the running for the BBL Championship title after securing their second biggest win of the season last night. Defending BBL Cup champions Leicester Riders knew what to expect against Newcastle Eagles, having beaten the same opposition by a five-point margin in the same fixture last season. Their arch rivals will feel hard done by this time, after making a fist of it from the tip-off. Veteran forward Charles Smith was a constant threat throughout - topping the score-chart with 27 points - to fire the Eagles into a 64 - 69 point lead with less than three minutes remaining on the clock. But the Riders rallied as a team, snatching the cup from the Eagles grasp - a collective effort saw forwards Andy Sullivan and Jay Couisnard notch 19 and 18 points respectively - and in the final seconds, Couisnard scored two free-throws, to tip the scales in the Riders' favour and retain the cup. Leicester Riders have won the British Basketball League Cup in dramatic fashion, beating Newcastle Eagles 72 - 69. In a close-fought encounter, the Riders battled back from 49 - 60 at the start of the fourth quarter, to retain the trophy for the second year running. After helping the Leicester Riders to a trio of trophies in his first season - and their most successful one ever - last year, point guard Jorge Calvo knows what it takes to win the big games. 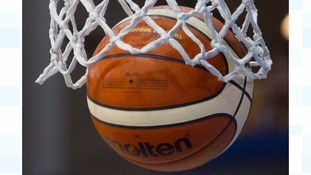 Leicester Riders take on arch rivals Newcastle Eagles, in the final of the British Basketball League Cup this weekend. The big showdown will take place at Birmingham's National Indoor Arena on Sunday, where the Riders will be contesting their fifth major final in a row, after winning three out of four possible trophies last season. They will also be looking for two BBL Cup victories on the bounce, after beating the Eagles 85 - 80 in a close-fought encounter in the same fixture last year. Controversial plans have been drawn up to build a new arena for the country's most successful basketball team at a cricket ground which is more than 100 years old. The Leicester Riders need a new base and are joining forces with Leicestershire County Cricket club and Leicester College. But proposals for the 2000 spectator arena at the Grace Road Stadium is causing anger to those who live nearby. Chris Halpin reports. Mike Siddall, Chief executive of Leicestershire County Cricket Club, says it must think of new ways to make money with dwindling spectator numbers coming to county cricket matches. He says the new Leicester Riders basketball arena will not only benefit the club financially, but will also be positive for the wider community who will have access to better sports facilities. Kevin Routledge - the director of the Leicester Riders, has said the club is working with those living near Grace Road cricket ground near the site of its proposed new arena. These are the early stage architectural drawings for the proposed new home for the Leicester Riders basketball team. The £2.5 million building could be built in partnership with Leicester College and Leicestershire County Cricket club by as early as next spring. The building will provide collapsible seating for 2000 spectators for league fixtures, but will turn into a three court community sports arena at other times. The building will also link in with gym facilities which are already at Grace Road, all of which will be open to the public.